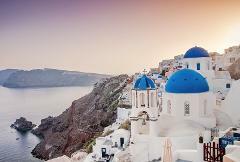 Taste the award-winning volcanic wines of Santorini as you move between the most legendary wineries of the island on a half-day santorini wine tour of three traditional wineries. Visit the crème de la crème wine estates of Santorini on a late-afternoon wine adventure and experience the iconic sunset at a hill-top winery on the volcanic cliffs. Discover the crisp volcanic wine of Santorini and learn how to cook melt-in-the-mouth Santorini dishes on a 6-hour cooking class and wine-tasting tour of the island's countryside. 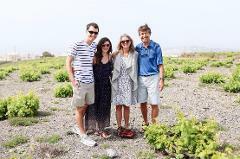 Explore the history and past of Santorini at the lost city of Akrotiri and spend your afternoon sipping crisp volcanic wines, on a 6-hour small group tour of Akrotiri and three Santorini wineries. See the breathtaking island of Santorini from the sapphire-blue waters of the Aegean Sea, on a half-day deluxe catamaran sailing experience including a full Greek meal along with Greek wine, beer and soft drinks served on-board. 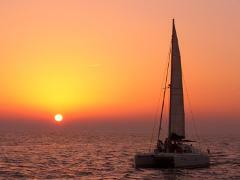 Experience Santorini’s sunset beauty, warm springs and beaches on a 5-hour deluxe catamaran cruise. Enjoy a full Greek meal prepared on board along with Greek wine, beer, and soft drinks and be treated to awe-inspiring sunset views. Experience the scenic wonders of Santorini on a half or full-day private custom tour with a personal local driver, customized entirely to your interests. 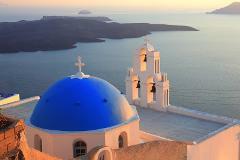 Cover all the major highlights of Santorini on a 5-hour private tour and explore the island from its half-submerged volcanic caldera to the amazing vistas of Oia town. Unfold the history and past of Santorini at the ruins of Ancient Akrotiri and witness the unique scenery of the volcanic landscape at the charming town of Oia. 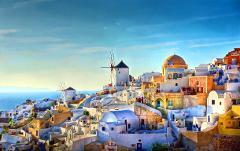 See the Santorini of your dreams on a private full day scenic tour with an expert local guide. Marvel the volcanic beauty and be wowed by unparalleled views from the breathtaking volcanic towns, nestled in the cliff-sides. Sip your way around the island on a private wine tour of the Santorini’s countryside, visiting three celebrated wineries on a customized day with a private guide. 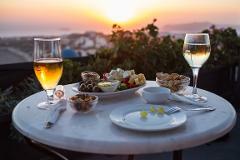 Sight-see through Santorini’s scenic towns and charming villages before exploring two traditional wineries to taste their vintages, including a local lunch at one of them. 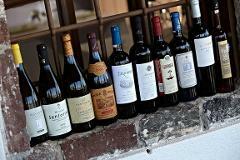 Visit five top estates and wineries of Santorini on a full day private wine tasting tour. 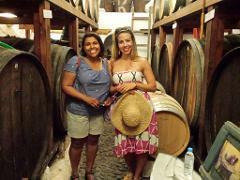 Explore modern state-of-the-art wineries and traditional Santorini wine cellars. 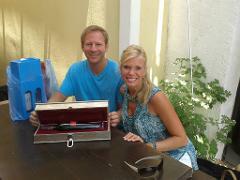 Lunch included on tour. 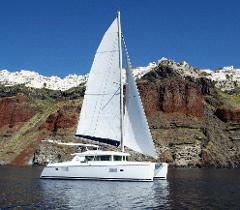 Cruise around Santorini during day or sunset time on a private 5-hour sailing cruise on board a modern catamaran. 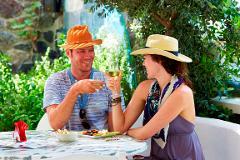 Enjoy a full Greek meal prepared on board including Greek wine, cold beer and beverages. 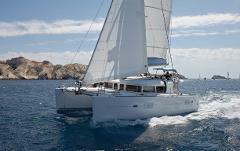 Cruise around Santorini on a private full-day (10h) sailing cruise on board a modern catamaran. 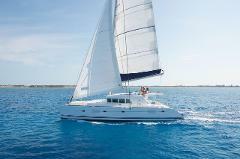 Enjoy a full Greek meal prepared on board including Greek wine, cold beer and beverages. Enjoy a one-way private transfer between all Santorini destinations such as the Santorini National Airport, Ferry Port, Santorini Hotels, & Airbnb's, Landmarks, Wineries, Ancient Sites and Santorini restaurants. 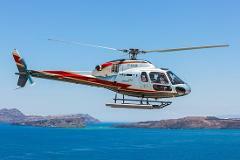 Soar above the picturesque landscapes of Santorini and the surrounding sea on an unforgettable 20-min helicopter flight over the island. Hit new heights on a private 30-min Santorini helicopter flight and enjoy incredible aerial views of the most stunning Greek island. 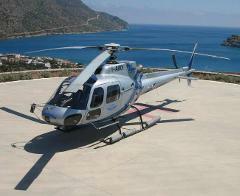 Travel in style from Santorini to Mykonos or vice-versa with our private helicopter transfer service. Choose one-way or roundtrip transfer, with waiting time at the island of your choice. 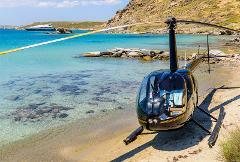 Board a private helicopter for a day of sun towards the magnificent island of Ios, famous for its golden sandy beaches of Maganari and Mylopotas. 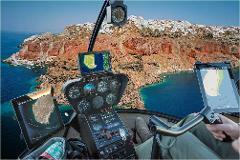 Travel from Santorini to Naxos or vice-versa with our private helicopter transfer service. Choose one-way or round-trip transfer, with waiting time at the island of your choice. 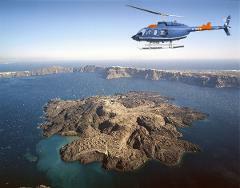 Travel from Santorini to Milos or vice-versa with our private helicopter transfer service. Choose one-way or roundtrip transfer, with waiting time at the island of your choice. 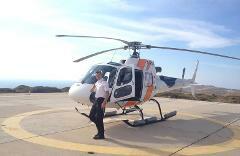 Travel in style from Santorini to Heraklion or Elounda and vice-versa with our private helicopter transfer service. 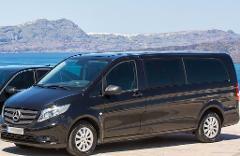 Choose one-way or round-trip transfer, with waiting time at the island of your choice.